The pronotum is yellow with a single squarish black spot near the center. The spot is usually well separated from the margin at the base of the pronotum. In the northern states and Canada the elytra have a yellow tip. 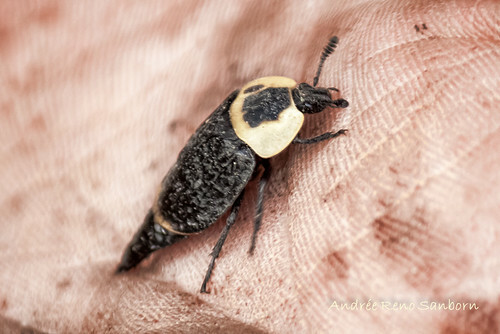 Margined carrion beetle (Oiceoptoma noveboracense) is smaller. The pronotum is orange. The black spot on the pronotum is cross-shaped and touches the margin at the base of the pronotum. Ridged carrion beetle (Oiceoptoma inaequale) pronotum is entirely black. The female lays eggs directly on or in a blown carcas of an animal rat sized or larger. Adults overwinter in the ground. 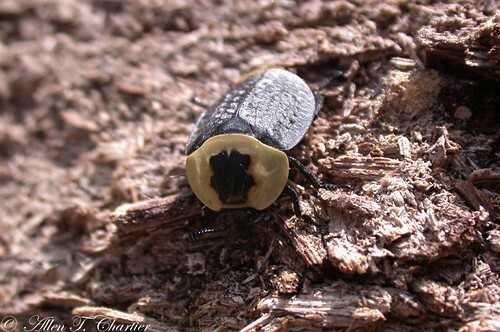 This beetle was formerly classified Silpha americana. This and all other North American silphid beetles, formerly in the genus Silpha, have been transferred to the subfamilies Nicrophorinae and Silphinae. Here we have the American Carrion Beetle. I spotting it flying and shot a stream of water at it from the garden hose, knocking it to the ground. One of the shots is of the beetle resetting it's wings, I'm guessing, for it didn't take off while I took a few images. Photographed at the Turtle River State Park, North Dakota (12 June 2012). Photographed at the Turtle River State Park, North Dakota (20 July 2010). Photographed at Turtle River State Park, North Dakota (30 July 2010).